We were at the Arundell Arms at Lifton for a work thing and after a day spent sitting around a table, writing on a flipchart and generally having to behave, all I wanted was to jump in some water. Luckily there just happened to be the perfect lake nearby, owned by the hotel. They use it to give fishing lessons. It's an old quarry and is serenely beautiful. I'd been chatting to the owner in the bar, and asked if we could have a swim. No problem, he said. How refreshing, no sharp intakes of breath and concern about health and safety issues. 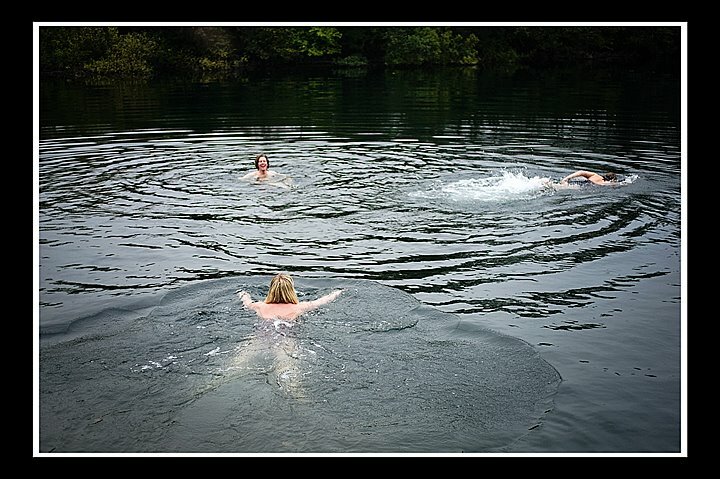 So at the close of play Kirk, Emma and I headed for the lake and dived in. Bliss. Thank you to Michael Marker for the great shot, and to the Arundell Arms for the swim. The wind was wuthering as we set off for Bugle Hole; the sea was a churning mass but the lagoon was relatively calm. Even so, getting in was slightly hairy as the water whooshed up and pulled back constantly, like a mad see saw. At low tide this pool is beach, it was strange to see it transformed into a perfect swimming pool. Seeking for further amusement we set off down the channel that leads out to the sea; it was a rock and roll rollercoaster, like being in a washing machine, with water foaming everywhere. The most exhilarating swim for months. Sometimes you just want emptiness. At Anstey's Cove the sea was flat and green and huge. I got in and swam over to the pinnacles of Long Quarry Point. I felt nothing except the resistance of the water. The feeling of oblivion out there was total. I like these Greta Garbo moments. It was the last day of the Indian summer and I walked to Sharrah Pool through dappled woods that glowed in their greenness. I was alone and didn't see anyone. As I approached the pool I noticed holly berries, already red and fat. There is something about Sharrah that stills your soul. You are enclosed by the trees but float under an expansively open sky. The water was its usual self; soft and kind in the wide pool and boiling and furious under the cascade. Every time I swim in the Dart at the moment the water is filled with gently falling leaves, languidly drifting down to the bottom, catching the sunlight as they go. They sparkle in metallic hues as they fall. It is Autumn in slow motion.